Filtrex designed the sludge recovery unit following the needs of the market to remove definitively the impurities from the LO circuit. The Sludge Recovery Unit consists in a metal basket filter installed in the ACP backwash line with a 4-way valve and a pressure indicator. An ACP-RM filter placed in a strategic location can eliminate many costly problems, protecting moving parts from wear and also acting as a monitor for the whole circuit. All the impurities retained by the automatic filter are removed during the backwash phase and concentrated in a dirty fluid.The dirty fluid is treated again by the Sludge Recovery Unit to remove the big impurities and to obtain a cleaner fluid to be delivered in the oil tank. 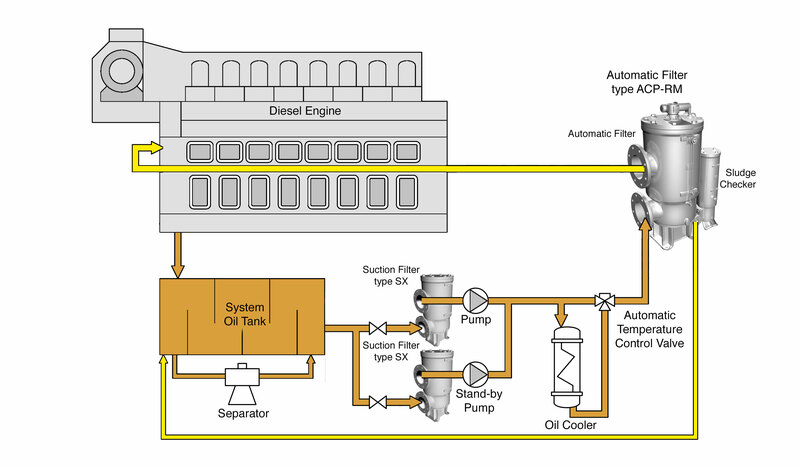 It greatly improves the quality of the oil being delivered to the engine’s moving parts (crankshafts, bearings, cylinder’s liners, piston’s rings) and other oil wetted parts in the equipment, thereby improving their reliability and longevity. 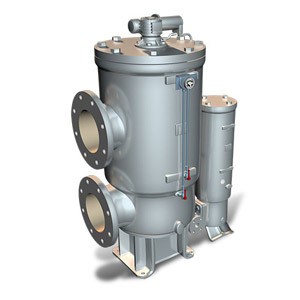 The Filtrex ACP+RM design ensures a compact configuration including the by-pass valve to allow the proper maintenance of the sludge recovery unit with the engine continuously in operation. Thanks to the metal filtering element, the sludge recovery unit can be easily cleaned when clogged without replacing. The impact on the environment is minimized since there is no need to dispose of used filter cartridges. Different size of RM are available based on the automatic filter installed.